Piggy Joshua is back for his semester break ( yay ! 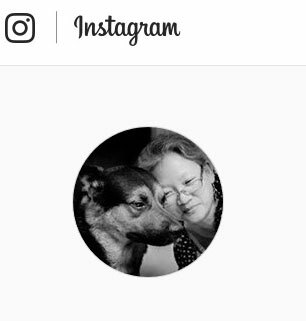 two whole weeks ) and I am back to cooking all his favourite food :) Away from home a whole semester, he missed homecooked food especially fish , pasta and burgers...I am most happy when my Piggies are back for their holidays :) I miss Joanna though....can't wait for her to be back . 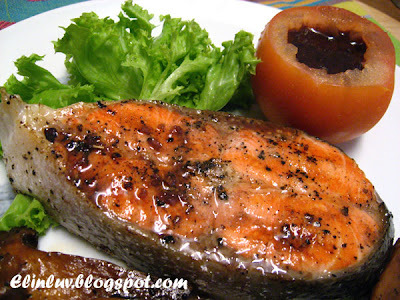 I pan fried salmon with salt and black pepper and make a red wine sauce to go with it . Added fresh King Oysters mushrooms as a side ....a perfect salmon dish I would say and mmmmm the red wine sauce was a perfect sauce for this salmon. Great combo ! 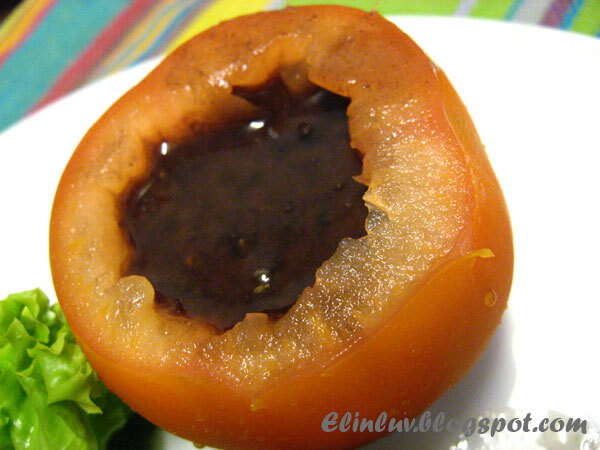 I googled for red wine sauce and I found this lovely red wine sauce , perfect for meat dish . It has just the right consistency and it taste great. Beautiful sauce ! This sauce is for meant for meat but surprisingly, for this pan fried salmon it was great too :) I served them in a tomato , took out the pulps and filled it with this lovely sauce. Pan fried the seasoned salmon steaks with olive oil till just cooked under medium heat in a non stick pan. 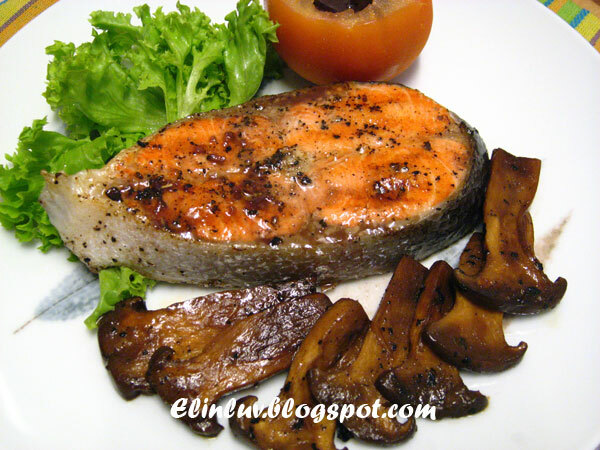 Dish up the fish steaks and with the remaining oil, sautee the mushrooms slices. Sprinkle with pepper and sea salt to taste. Dish up and serve as a side for the salmon. 1. Add 1tsp olive oil to a non stick sauce pan, under low heat , saute minced shallots till transparents. Do not burn the shallots. 2. Crank your burner to high heat and add 1/2 cup each of stock and red wine. Allow the mixture to reach a strong boil. 3. Reduce the sauce down by about 50 percent by allowing it to boil awhile. 4. Bring the heat down to medium or medium low. Pour in 1 tbsp of balsamic vinegar Add 1 tsp of Dijon mustard. At this point, it is all about consistency. Continue cooking until the sauce has reached the level of thickness you prefer. 5. Turn off the heat and add 3 tbsp of butter. You may find it easier to stir in the butter if you have divided it into small pieces, rather than dropping in entire pats. You can also melt the butter ahead of time in the microwave, if you so choose. 6. Finish it off by adding pepper, salt and about 1 tsp of finely chopped thyme leaves. 7. Sauce your meat and serve right away. Joshua must be thrilled to be getting home-cooked meals like this one for the next two weeks. What a tempting salmon dish! Lovely meal, Elin! 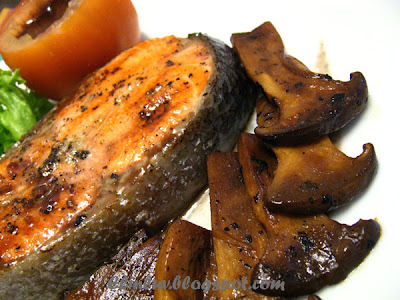 The mushrooms and salmon look like a perfect pair! Have a great time with Joshua! Elin, this looks super duper! The salmon steak makes me salivate! That's a real good dish! You have some lucky piggies. I could really go for some salmon! I always love the way you preapare the western meal. It looks just like it came out of a 5 stars restaurant. Lucky Joshua. Lucky Joshua! One slice of salmon already cost about $18.00! haha... So, must not waste even a bite huh! But the best is he's back to accompany you. He's such a good boy. ^_^ Enjoy your day and happy cooking! great salmon dish, I bet Joshua loves being home with these meals..
OMG....that salmon looks amazing!!! I have never thought of using red wine with salmon, that is pure genius! Those mushrooms look delicious, what a perfect meal!! Joshua is having a great time eating at home and is enjoying his starcraft game :p Can see he is having a great time unwinding before his next semester start. yummy yummy a lot better then the one i had for dinner last nit. Your dinner is fabulous! 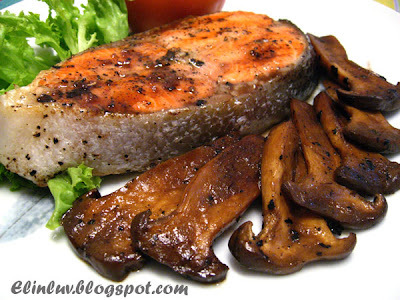 Salmon is one of the few fish which can be paired successfuly with some red wines, and this looks great, especially with those mushrooms. I love Alaskan Salmon, especially Sockeye. Nice job!